Centuries before the Black Death decimated the population of Western Europe, an earlier plague epidemic took out over 50 million people (about 15 percent of the population) in the Byzantine empire. A team of German scientists has confirmed that the two plagues were caused by the same bacterium, albeit genetically different strains. The so-called Justinian plague—named after the Eastern Roman Emperor Justinian I, who actually survived his bout with the disease—first broke out around 541, spreading rapidly across Asia, North Africa, the Middle East, and Europe. At its peak, historical records show that the disease claimed 10,000 lives each day in Constantinople, although modern scholars think it might be half that number. Bodies were stacked in the streets, making the entire city reek of decay. Waves of the Justinian plague variety continued to break out for the next three centuries, gradually becoming less virulent. Historians have speculated that infected rats (and their fleas) aboard ships importing grain brought the disease to Constantinople via Egypt. The plague is caused by a bacillus called Yersinia pestis (Y. pestis for short). It’s so virulent that injecting mice with a mere three bacilli was sufficient to kill them in experiments — and a single flea bite can transmit 24,000 of the deadly microbe. Map of the location of the Altenerding archaeological site where the remains of Justinian plague victims were found. According to a new paper in Molecular Biology and Evolution, genetic analysis of the remains of plague victims found in an ancient German burial site confirmed that this particular strain of the bacillus came from China. Specifically, they analyzed tiny variations within the Y. persis genome, recovered from the skeletons. Such variations are the result of mutations called single nucleotide polymorphisms (SNPs) that make them unique. SNPs are a bit like the typographical errors that occur over repeated copying, except in this case it is not a manuscript being copied but DNA. Cells replicate by dividing in two, and each new cell carries the same full set of instructions contained within the DNA. But with each replication, small variations creep into the sequence at particular locations on the genome. Earlier work by a team led by Dave Wagner, a microbial geneticist at Northern Arizona University, among others, first pinpointed Y. pestis as the culprit behind both the Justinian Plague and the Black Death. 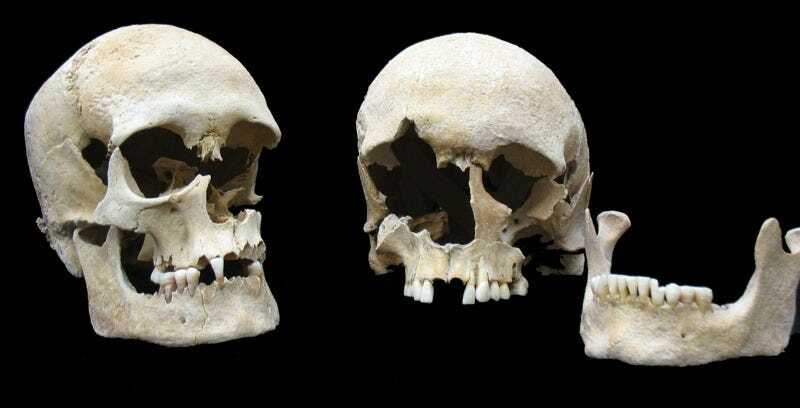 This was based on an analysis of gleaned from the teeth of two German victims killed by the plague around 1500 years ago. However, the Black Death plague wasn’t a direct descendent of the Justinian version, according to co-author Michal Feldman of the Max Planck Institute for the Science of Human History in Jena. Rather, it’s more of a distant cousin rather than direct offspring. Remains of an adult woman (left) and adult man (right) excavated at the Atlenerding site. Evidence of Y. persis was found in the remains. Feldman and his co-authors have confirmed these earlier findings. And while Wagner’s team reconstructed a partial genome, Feldman and his colleagues now have a complete reconstructed genome for the Justinian plague, including 30 newly identified mutations and correcting 19 false positive mutations from the earlier analyses. “This is important to prevent premature conclusions from influencing future research,” Feldman told Gizmodo. Naturally, more research is needed into these newly detected unique genetic features. At least some of those mutations might be linked to the virulence of Y. pestis. And this particular strain turns out to be much more diverse than scientists previously thought. This could one day shed light on how genetic factors influence the emergence and spread of pandemics—and since plague has re-emerged in some geographic regions, that could definitely help save many lives in the future.